Rockford’s beautifully restored Coronado Performing Arts Center welcomes many high-profile performers since its grand reopening in 2001. The landmark Coronado Performing Arts Center and its contemporary counterpart, Starlight Theatre at Rock Valley College, anchor a robust regional arts scene. When you consider other A-list attractions such as Anderson Japanese Gardens, the Burpee Museum of Natural History, The Discovery Center Museum, the BMO Harris Bank Center and many smaller regional attractions, there’s no shortage of entertainment options. Even in tough times, the arts and entertainment industry survives. People need a laugh, a good cry, something to make their hearts beat faster or soothe them like a warm bath. In a better economy, people have more money and time to spend – conditions that also benefit show business. To be sure, challenges confront our entertainment venues, especially as new technologies change the way they promote events and attract new audiences. But whatever’s to come, the need to be entertained won’t go away. It’s always been part of the human experience. If 40,000 tickets are sold in an average summer season, Webb perhaps has filled more than a million seats. What sets Starlight apart from other community theaters? First, it benefits from good lineage. At the time Starlight staged its first production, Finian’s Rainbow, in 1967, Ted Bacino was building the fledgling dramatics program at Boylan Catholic High School in Rockford. Bacino ignited a competitive fire that led the public schools to up their theatrical games and fed a culture where students believed “they could do this for real in the real market,” says Webb. Among the most notable of Bacino’s disciples are Tony-nominated singer-actress Marin Mazzie (Class of 1978), Tony Award-winning director Joe Mantello (Class of 1980) and Bob Greenblatt (Class of 1978), chairman of NBC Entertainment. Each performed at Starlight, along with a host of other local talents. The stories of their success still reverberate on campus, Webb says. Starlight also benefits from good architectural bones. No matter what production graces the stage, the open-air venue is a star in its own right, and always has been. In 1967, audiences brought folding lawn chairs to see Finian’s Rainbow beside the old farm pond. Today, they gather beneath an artistic marvel designed by Belvidere native Jeanne Gang and built in 2003 during an $8.5 million Starlight makeover. The crowning feature, a roof that retracts in a star-shaped pattern, has won design awards and draws visitors from around the world. Uncharacteristically modest in a field that rewards flamboyance, Webb says his greatest contribution has been stability. In 1999, then-President Chip Chapedelaine asked Webb what would take Starlight to the next level. 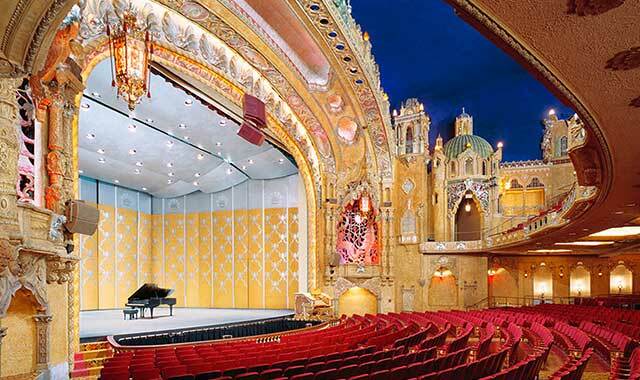 Of the various arts organizations that occupy the Coronado Performing Arts Center stage, the Rockford Coronado Concert Association (RCCA) is probably the most interwoven with the opulent 1920s former movie palace. In the years prior to the theater’s $18.5 million restoration, the Rockford Symphony Orchestra had moved out. Movies had stopped being shown long before that, but the community concert group – founded in 1936 and bringing the best in music and dance since 1942 – remained. The roof over the lightboard leaked, and an occasional pigeon swooped across the twinkling ceiling. RCCA issued the call to save the architectural gem, and its then-president, Mary Ann Smith, led the Herculean fundraising campaign with her late husband, Gordon. Fourteen years since its grand reopening, so many internationally acclaimed ballets, big-name comedians and local wedding parties have paraded across the stage that it’s easy to forget how the rebirth of Rockford’s “Wonder Theater” blazed the trail for the downtown turnaround being applauded today. A stellar venue like the Coronado demands stellar bookings, and RCCA delivers the crème de la crème: opera soprano Stephanie Blythe, the Chamber Music Society of Lincoln Center and pianist Emanuel Ax, to name just three. With the help of charitable contributions and a loyal subscriber base, RCCA secures the world’s top classical and semi-classical artists and brings them to town at an affordable price. Offering five concerts for $100, RCCA fulfills the original mission of Depression-era community concert groups. For 32 years, Mary Ann Smith showed the way, limiting her involvement in 2012 by becoming president emerita. While RCCA does its part to book acts, many acts are also scheduled through the Rockford Area Venues & Entertainment Authority Board (RAVE), a public authority that also manages the BMO Harris Bank Center and Davis Park. Turnaround planning, turnaround teams and turnaround management are popular buzzwords these days. But at the BMO Harris Bank Center, they’re words with meaning. Rockford’s downtown sports and concert arena, often a source of controversy and a pool of red ink that matched its blood-orange exterior, is enjoying the sixth year of a stable new existence. Orangey red, it seems, is the new black at BMO. In 2008, a $23 million renovation expanded the ice surface, added restrooms and brought a high-tech video scoreboard, new press box, executive suites and glass lobby, among other enhancements. Since then, the arena has hosted dozens of sold-out shows, including country music sensations Braid Paisley and Reba McEntire, Thunder Nationals Monster Truck Racing and Disney’s High School Musical on Ice. This February Miranda Lambert packed the house, fresh from a performance at the Grammy Awards. BMO’s rising fortunes, however, most reflect those of the Rockford IceHogs, the professional hockey team that’s skating toward an attendance record this season with an average of 5,000 fans per game. Hockey has become increasingly popular since 2007, when Mayor Larry Morrissey scored a public purchase of the privately owned team for $3 million and a 10-year affiliation deal with the Chicago Blackhawks, which elevated competition into the American Hockey League. The municipal takeover of the IceHogs coincided with a strategic move engineered by RAVE and its chairman, Mike Dunn, to hire SMG Worldwide Entertainment as the private manager of BMO, the Coronado Performing Arts Center and Davis Park. Since taking over, SMG has reduced the reliance on public operating subsidies and ushered in a new level of customer service. The challenge going forward is diversifying the events calendar. Look for more Latino music, food events and concerts that appeal to the 18- to 26-year-old demographic, such as a floor show featuring local bands. Standing in the glow of the Rockford Symphony Orchestra (RSO) in the 21st century, it’s almost impossible to picture the gloomy state of affairs Steven Larsen faced when he took the maestro’s baton in 1991. The previous conductor had caused internal rancor, with what many regarded as his contemptuous attitude and his disregard for budget considerations in the pursuit of high art. Concerts were drawing 500 to an auditorium that could have accommodated 2,000. “A good chunk of the Board had quit, and those who stayed were thinking about closing the whole thing up,” remembers Larsen. The fix, he demurs now, wasn’t really that difficult. Since those tenuous times, the RSO annual budget has grown from $250,000 to $1.3 million, and its musical prowess has attracted guest artists from Dionne Warwick to Itzhak Perlman and Yo-Yo Ma. The annual Holiday Pops concert and a production of The Nutcracker with Rockford Dance Company are must-sees for families across the region. Broadcasts of the Classics Series by Northern Public Radio expands RSO’s reach by 50,000 listeners. “I don’t think you’d find anyone in this town today who thinks the symphony is snobby or elitist – even people who’ve never heard us perform,” says Larsen, who received the Mayor’s Arts Award in 1999 and was named Conductor of the Year by the Illinois Council of Orchestras in 2006. The high note of Larsen’s tenure – he’s only the fifth conductor in 80 years – was the symphony’s return to the restored Coronado Performing Arts Center from the Midway Theater in 2001. Pecatonica may be a small town populated by a surprising number of theater enthusiasts, but it’s a far cry from Blaine, Mo., the fictional setting in the 1997 mockumentary Waiting for Guffman. Rick Smith likes to contrast Pec Playhouse with the delusional, no-talent film characters played by Eugene Levy, Catherine O’Hara and Parker Posey. With the exception of the director and sometimes the choreographer, Pec Playhouse is an all-volunteer operation. Lack of a regular payroll and low overhead make admission a bargain, but not one that comes at the expense of quality. The intimacy of the 124-seat storefront stage is also part of its charm. Students, parents and townsfolk formed Pec Playhouse in 1991, after school officials cut fine arts to plug a budget hole. With membership dues and proceeds from a car wash, they financed Out of the Frying Pan. Productions moved from Pecatonica High School to the American Legion Hall to the current location, which dates to the 1880s and recently had its lobby renovated. Shows are selling out consistently for 2015, the 25th season, which began in February and concludes Dec. 6 with Miracle on 34th Street. The Addams Family and The Crucible are waiting in the wings for respective summer and fall runs. Of late, the Pec Players have been hitting the road, to stage murder mysteries as fundraisers for other nonprofit organizations. Half or more of all ticket buyers travel from Rockford. Others come from Freeport, Byron and Monroe, Wis. They stop at Cimino’s for dinner or Booties for a drink, spending an estimated $125,000 annually in the town of nearly 2,000. “Philharmonic” and “symphony” are synonymous by definition, but the artists formerly known as the Beloit Janesville Symphony Orchestra hope philharmonic implies something less formal and more inviting. They also hope their name change in April 2014 conveys their desire to chart new horizons, both geographically and musically. “We want to embrace a wider rubric and wider mission,” says Robert Tomaro, now in his 15th season as music director. Rock River Philharmonic is working to add performance venues to a regular season that’s rooted at the Janesville Performing Arts Center and Beloit College’s Eaton Chapel. So far, new concert locations have included The Armory, a music-dinner hall in Janesville, and The Castle, a church-turned-stage in Beloit. Future dates are being eyed south of the state line. At the same time, the philharmonic is spreading its wings in regard to its programming, adding an Explorer Series to its classical and family pops concert packages. Tomaro says the Explorer Series challenges convention, by mixing musical genres and blending art forms. Since the Beloit International Film Festival’s inception in 2005, the philharmonic has performed original music to accompany the screening of a classic silent movie. This year, the philharmonic featured a 1906 church organ at The Castle to accompany the 1925 film version of Phantom of the Opera, starring Lon Chaney, and juxtaposed the period score with a soprano, tenor and pianist performing Andrew Lloyd Weber tunes from Broadway. Phantom sold out 10 days in advance. As a matter of fact, the success of the film festival appearances in attracting new concertgoers influenced the rebranding decision, says Tomaro. Coming soon: Two Views of the Blues will feature a solo pianist performing Gershwin’s timeless Rhapsody in Blue, and a contemporary band – with Tomaro on guitar and lead vocals – jamming some Mississippi Delta blues. Future shows may incorporate dance or mixed-media displays. It’s right there in the tagline, really, the essence of Artists’ Ensemble: “We build character(s). Both are descriptive, but the shorter of the two cuts to the core of what makes Artists’ Ensemble special in our region’s live performance milieu. Seating is indeed limited in the Cheek Theatre on Rockford University’s campus, which has been Artists’ Ensemble’s base since 2004. Cheek can accommodate an audience of 150, give or take, depending on the constructs of a particular set. Artists’ Ensemble is indeed adventurous in its choices of shows. The titles are rarely familiar to ticket buyers and have included seven locally penned world premieres in 11 years. In June, the current season ends with The Spitfire Grill, a musical about an ex-convict trying to make a fresh start as a waitress in small-town Wisconsin. Spitfire Grill may be a musical, but don’t expect lavish costumes or elaborate production numbers. That’s not how Artists’ Ensemble has built its reputation. That’s because Artists’ Ensemble is one of the few Actors’ Equity theaters in Illinois outside of Chicago. Visiting professionals are surrounded by a beloved stable of resident players including Linda Abronski, Patte Armato-Lund, Jan Bacino, Carolyn and Rufus Cadigan, Jessica MacDonald and Stephen F. Vrtol III, all of whom have enjoyed decades-long love affairs with ticket buyers. Margaret’s husband, Richard Raether, has been the ensemble’s fearless leader since its veteran members took a leap of faith and broke away from New American Theater, the storied downtown Equity house established by J.R. Sullivan in 1972 and shuttered in 2006. The venue now operates as the Rockford Public Library’s Nordlof Center.